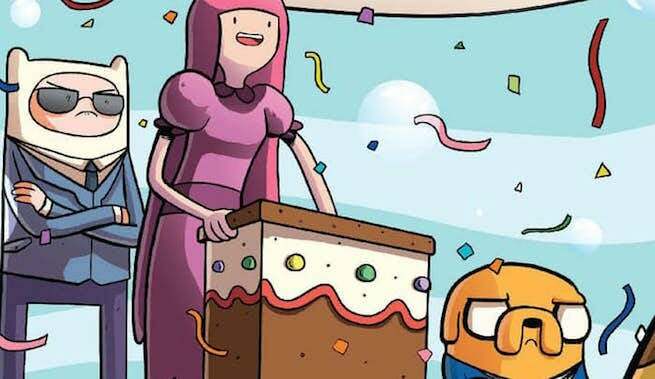 This week -- ahead of schedule, which is a phrase you almost never hear in American comics -- the Adventure Time: President Bubblegum original graphic novel will land in comic shops from writer Josh Trujillo and artist Zachary Sterling and Phil Murphy. In the book, the King of Ooo approaches the Candy Castle and proclaims that he has discovered the long-lost ConstitOootion. When Candy Law Professor verifies the authenticity of the document, which states in one week there will be an election for Ooo’s first President, Princess Bubblegum will have to race against her enemies...and frenemies, to ensure her spot on the throne. Of course, the book comes along just as one of the most vicious U.S. Presidential races in recent memory is heating back up again, with former Secretary of State Hillary Clinton's lead over businessman Donald Trump narrowing for the first time in weeks. So while Adventure Time is providing readers with a break from reality, it's also thematically geared to what the world is already talking about. We talked briefly with Trujillo via e-mail about the challenges that come with writing a cartoon character running for President -- no, not that one, the other one. No, the other one! -- and what excites him about the book. You can also check out some exclusive art from the graphic novel in the attached image gallery. What came first: the desire to make an election story, or the idea for this OGN's story? I knew when I got the opportunity to write my second Adventure Time graphic novel that I wanted to put the spotlight on Bubblegum! She is one of the most complex characters on the show, and I wanted to explore the challenges of ruling a crazy world like Ooo. With the American presidential election coming up (and occupying way too much of my attention), I felt particularly inspired. How difficult was it writing this to keep the election more absurd and fantastical than the one actually going on in the US right now? I sent in my pitch for this book almost a year ago, so I wasn't even certain who the major candidates would be when I first hashed out the story! The election for President of Ooo is one wacky piece of a much more epic story. As they say in a certain revolutionary musical, "Winning is easy. Governing is harder." How much communication did you have with your artist on this book? I'm always struck by how difficult the job must be to do visually interesting and different work within the constraints of a licensed book where you have to be on-model. Phillip Murphy did the line art for this tale and (as always) he knocked it out of the park. He is such a pro and never struggled to bring even my craziest ideas to life! Since he is based in Ireland we didn't have a lot of direct communication. However, every time I saw new pages coming in my job dropped in awe! You're going to love Bubblegum's new pantsuit!! Who will be running against the princess? Bubblegum has some tough competition, and she's not used to having to campaign for votes! She's up against the sinister Tree Witch, the adorable (but also sinister) Toronto, and... who else? Oh, yeah! A certain purple, sassy—actually I can't spoil the whole story! Assuming she wins, will there be a title change, or will she just be President Princess Bubblegum? If elected, Princess Bubblegum will sadly have to relinquish her princess title. President Princess Bubblegum might be a little too much of a mouthful.